According to an article posted by TVNEWSDAY, this year’s NAB Show will showcase a variety of cost-effective cameras that feature IT efficiency and fit downsized budgets. In something that has been historically uncharacteristic JVC, Panasonic and SONY have released a lot of information about their product offerings long in advance of NAB. In January, JVC introduced new Final-Cut-Pro 6™-ready solid state camcorders that feature their ProHD camcorders that can natively record Quicktime for Apple’s Final Cut Pro directly onto SDHC memory cards. The GY-HM100 hand-held 3-CCD camcorder was introduced in January and on February 10, JVC introduced the GY-HM700 shoulder camera. Both camcorders record 35Mbps high definition video and uncompressed audio directly to SDHC media cards in the Quicktime format used by Apple Final Cut Pro™. The camera’s also inroduced solid state recording into JVC’s professsional line. One day later on February 11, Panasonic announced a huge slate of products including the AG-HPX300 which is a shoulder mount P2 HD camcorder. Panasonic is billing it as the “world’s first affordable 10-bit, 4:2:2 camera”. According to the TVNEWSDAY article the HPX-300 will cost $10,700 U.S. and comes with a 17x Fujinon lens. The camera employs one-third-inch CMOS native HD imagers and according to Panasonic the imagers overcome the physics of small chips and deliver low light sensitivity. Just in case your interested in Panasonic’s other announcemnts you can find them here. In a nutshell they’ve announced a new 17” BT-LH1710 HD LCD Production Monitor, an AJ-CVF100G color viewfinder for higher end P2 HD and DVCPRO HD camcorders, an AJ-PCD35 P2 memory drive with PCI Express interface for fast transfers,an AW-HE870 2/3-inch 3-CCD HD convertible camera, a free AVCHD-to-DV transcoder update, the AJ-HRW10 Rapid Writer P2 workflow tool, an AG-HPG20 P2 HD portable Recorder/Player that features AVC-Intra recording and an expansion to their professional AVCCAM product line with a compact HD Recorder and multi-purpose camera head. According to Glen Dickson of Broadcasting & Cable, SONY surfaced last week. According to his post, Sony is saving most of its major product announcements for NAB 2009 but last week it previewed a handful of new products. They included an HDV-format high-definition camcorder, the HVR-Z5U, which is a compact point-of-view camcorder, the HXR-MC1; and two new LCD monitors, the BVM-170 and PVM-L2300. According to Dickson’s post SONY also announced a new field recorder for the XDCAM HD optical-disc format, the PDW-HR1, which supports legacy formats including MPEG IMX, DVCAM and 4:2:0 HD 24P content. 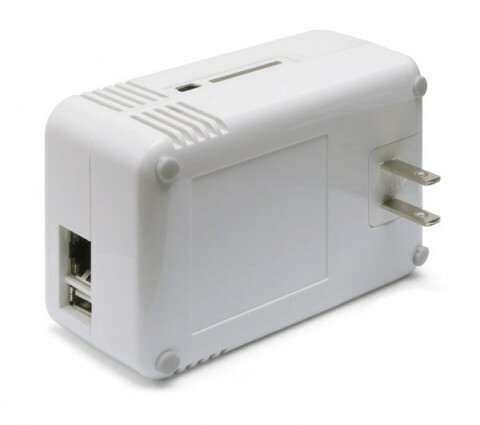 According to SlashGear Marvell’s SheevaPlug is a device that hides an entire Linux PC in a wall-wart power supply. Priced at $99, inside it there is an ARM-based 1.2GHz Sheeva processor, 512MB of DDR2 memory, 512MB of flash storage, gigabit Ethernet and USB 2.0. Eventually, prices are expected to drop to around $49 and it’s designed to take a USB hard-drive and turn it into network attached storage. Not only will this be from a home network but users can access the drive through a web-based portal. Marvell claims it uses less than one tenth of the power of a typical PC being used as a home server. NerdLogger has a great post on this technology as well that goes into greater detail on its potential. The 2009 NAB Show will be held April 18-23 in Las Vegas and according to an NAB press release there will be more than 70 new exhibitors as well as a wide variety of traditional NAB exhibitors on the 850,000 square feet (ouch my feet!) NAB Show floor. New exhibitors include Electronic Arts, Phillips 3D Solutions and 3ality Digital, and they’ll join 1,600 companies, including 430 international exhibitors, that attendees can visit during the Show. Apparently NAB 2009 is going to have several new attractions. Amongst them two pavilions dedicated to showcasing cutting-edge 3D technologies and the latest in mobile technology. One cool area that I always visit is NHK’s Ultra High Definition TV technology. And perhaps just as cool are demonstrations that will be presented by the National Institute of Information and Communications Technology’s (NICT). They are going to highlight the latest discoveries in holographic television and 3D high definition transmission technologies. Below is another video that explains why NAB is important. It’s called Content Central. Just a short post. I found another article about the benefits of switching over to free over-the-air High Definition Digital Television. It’s titled “The wonders of the new digital channels” and its written by Jerry Schwartz of the Associated Press. As most of you are aware some of the American analogue stations have shut off their transmitters with the remainder of stations doing so later on in the year. Yahoo News ran this article that talks about his experience in switching to DTV. He comments on a number of side (or sub) channels available in the New York City area. Funny he too asks the question….. Why pay for cable? The Impress flexible touchscreen by Dis.play is soft and is said to break the distance in the relationship of the human and technology. The video below is really impressive especially in the way it allows for hand molding of computer generated 3D media. Below is a demonstration of how touchscreen interaction is advancing. Stantum’s technology employs resistive touchscreens that allows for accuracy beyond the pixel density of the display. The display offers some incredible input methods that includes gesture recognition, cursor management and physics processing. Digital pens have been around for years. They started as devices that write with ink and record the handwriting so it could be displayed on a computer screen. Livescribe’s Pulse can actually record audio and upload notes to your Windows computer. At US$199.95 it would be an expensive pen to lose.Employing a dot-positioning system, an embedded infrared camera tracks everything written or drawn on proprietary paper which is covered with nearly invisible dots. On the bottom of each sheet is a menu of controls that allows the the pen to start, stop, replay, and fastforward a recording on your computer screen.